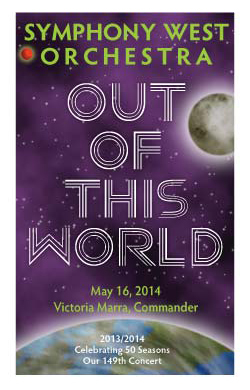 This evening’s concert is sponsored by the horn section: Walt Zacharias, Melissa Laubenthal, and Amanda Scheider. Performance of The Amusement Park Suite is made possible by Cindy M. Hauck. Thank you to all of our donors for your continued support! Do you have a costume from a long time ago or a galaxy far away? Dinosaur duds? Hobbit slippers? 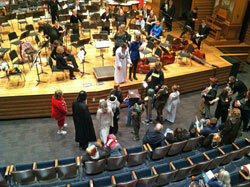 Then boldly go where no audience member has gone before and wear them to our concert. Prizes for best costumes! 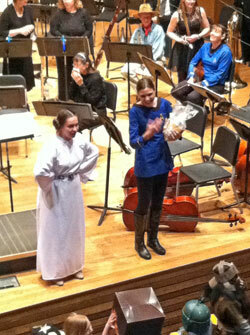 Violinist Kristen Camloh (Princess Lea) and cellist Cathy Frantz (Starfleet Science Officer) conduct the costume contest. Costume contest entrants vie for the top prize! Winner in the kids category was "Gimli the Dwarf," and the adult winner was "Dr. Who."